Jimmy Swaggart Expositor’s Study Bible: THE LIE From SATAN! 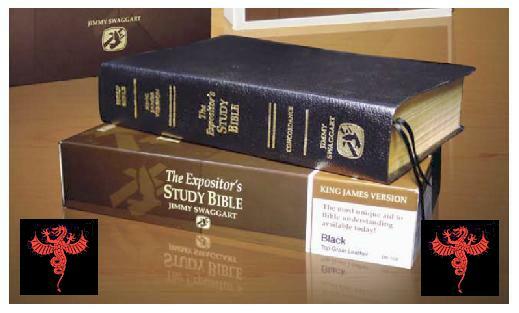 The Jimmy Swaggart Expositor’s Study Bible is “of the Devil”! It speaks “THE LIE” from SATAN as though it were God’s Truth. In the preceding Scripture, Jesus announced His imminent suffering and death on the cross. The time was near for Jesus to fulfill God’s 4000 year old promise of “The Messiah” (Genesis 3:15) who would take away the sin of the world so that all who trust in Him might be saved from the everlasting fiery torments of Hell. What an awesome time in the history of mankind! 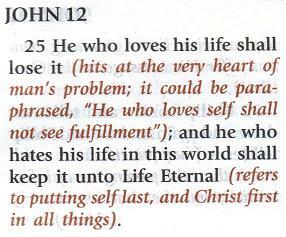 You see Jimmy Swaggart says that “He that loveth his life shall lose it” could be paraphrased “He who loves self shall not see fulfillment”, but just what has “lack of fulfillment” got to do with “everlasting destruction”? There is absolutely no correlation between the word “fulfillment” and “everlasting death”! Hell is the total absence of any type of human fulfillment or satisfaction! “Suffering” in the burning fires of Hell for all eternity is what “lose it” is all about, and that’s what awaits those who please themselves (my will) instead of God (His Will). Christians must “hate” whatever “desires, interest, and good intentions” they might have that are not the Will of the Father. Christians must “die” to the “desires of self”, which is in no way the same as “putting self last” as Jimmy Swaggart has stated. So why does Jimmy Swaggart continually “deny” the facts? Why did Jimmy Swaggart list all sorts of things that Believers must “deny” (“strength, ability, talent, power, and carnal intellect”) but yet leave out the one thing that’s all encompassing – “SELF!!!”? The Holy Bible – the Word of God – plainly states that we must die to what we want (our will) in order to do what He wants (God’s Will), and this entire process of “suffering” through the “denial of self” in “obedience to God” is described as “taking up the cross”. “Our cross” is “the cross” that we must all bear. But yet “the Cross” that Jimmy Swaggart keeps referring to in his bible is the cross that Jesus bore. In other words Jesus did all the suffering for us at “His Cross”. Jimmy Swaggart says that Jesus’ command – “Whosoever will come after me, let him deny himself, and take up his cross, and follow me” – does not mean “suffering as many suppose”! 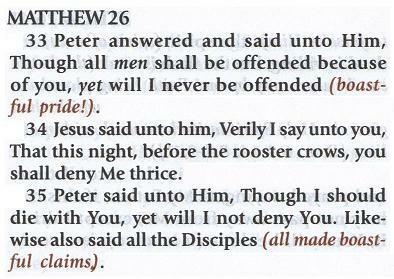 Jimmy Swaggart says that to “deny him (Jesus)” means “to denying what He did for us at the Cross”, but of course “the Cross” that Jimmy Swaggart is referring to is “the Cross to which Jesus was nailed” and not “our cross” by which we must suffer. In fact, Jimmy Swaggart is dead wrong! 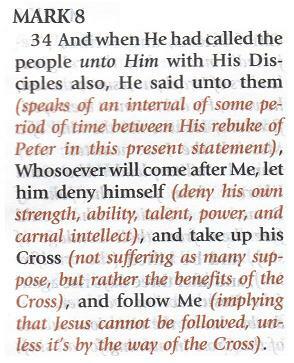 That was absolutely all that Jimmy Swaggart had to say about Peter denying Christ. 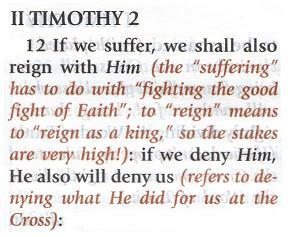 And of course the very obvious reason that Jimmy Swaggart didn’t elaborate was because this Scripture diametrically opposes his belief that we don’t have to “suffer” for Jesus in order to be saved. Jimmy Swaggart preaches/teaches “another gospel” because Jimmy Swaggart preaches/teaches “another cross” which is THE LIE from SATAN. Jimmy Swaggart and his Expositor’s Study Bible will not only doom his soul to Hell for all eternity but multiple thousands of others as well. But does anybody care??? It’s not too late to turn Jimmy Swaggart back to God’s Truth, but is anyone willing to help? 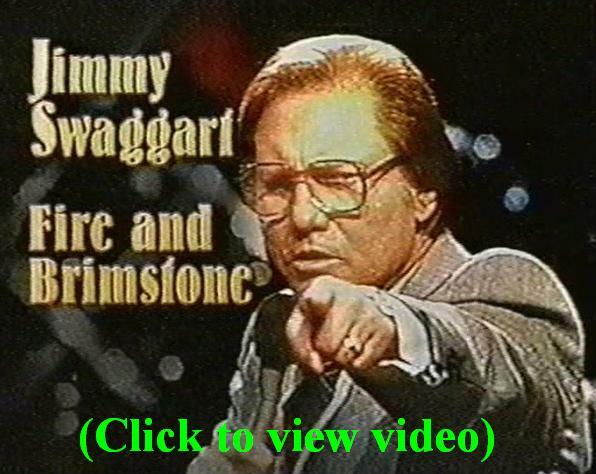 Please contact me if you really care enough to help Jimmy Swaggart see the truth of his error.